DAILY 5 Word Work, Read to Self and Others and Writing MEGA BUNDLE! 650 pages! Purchase the MEGA BUNDLE and save over 20%!!!!!! 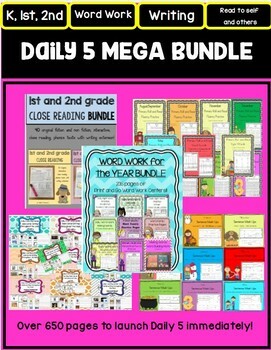 If you need to start Daily 5 and are having a difficult time wondering where to begin, this is the Mega Bundle set for you! Get Daily 5 up and running in your classroom in no time! Use these reading "Print and Go" bundles to fill your Word Work, Writing, and Read to self or Read to Others centers in a flash! If you purchased these products individually you would spend over $125. Please check out the preview and click on the links below to see what is included and read the reviews of what people are saying about these awesome products! Word Work for the Year Bundle: This bundle features 9 of my word work centers to keep your kids learning and having fun too. You can use this bundle in a variety of ways. I have a different page available for students to choose from each day of the week. For example, Mondays are sight word days, Tuesdays are word family days, Wednesdays are Sentence Mash Up days, etc. With over 200 pages you have enough to keep students happy and engaged all year! Writing Task Cards for the Year Bundle: Get even the most reluctant students writing with this easy to use, ready made center!! Everything you need for your writing center for THE WHOLE YEAR Features over 250 writing task cards, over 480 matching picture vocabulary cards to peak interest and help with writing sentences, writing paper, alphabet reference sheet, and initial sound reference sheet! *** Lexiled text: This resource can be used from grades 1 -3, depending on the learners in your classroom. Remember, you know your students best. Please check to see if these Lexiles will be a good fit for your class! A more detailed list of titles, lexiles, and blends is listed at the bottom. ***phonics connected: each page focuses on a specific blend or digraph that contains 4 or more focus words in the text. Students will highlight each focus word as they read. Please see the list below of all titles, lexile levels, and phonograms and blends that are addressed in this bundle! ***practice finding evidence: Students will use three different colors to go back into the text and underline where they found the answers to the multiple choice questions. ***answering questions about the text: Students will practice answering comprehension questions about the text. ***writing extension: Students will answer a written questions and must provide support/evidence from the text in their answer. These passages can be used in guided reading, MTSS/RTI, centers, or homework practice. If copies are an issue at your school, just print one, put in a clear pocket sleeve, and use dry erase markers to complete. They can write their response in a reader's response notebook or notebook paper. Roll and Read Whole Year Bundle: 9 months of Roll and Read Fluency Practice Pages plus my Sight Word and Vowel Pack! Each month features different themes and covers many academic topics taught in each month. A great way to incorporate Social Studies into your reading curriculum and a fun way for students to learn. Please click on each individual link to see what is included in this huge bundle! Use these fun Roll and Read fluency pages in a center or as a guided reading follow up. Features easy to read dolch words and many CVC, CVCC, and CCVC words that are easy to decode. High interest topics to help students want to read! Great for partner work at centers and will last for more then one day. Students simply roll a die, and then read a sentence from that column. Their partner checks to see that the sentence is read correctly and then the students can color in the whole rectangle they read. I have also done this activity where each partner chooses a color and only one paper is turned in for the two students showing the two colors the students chose and what sentences they read. If copies are an issue at your school, simply make one copy and place in a sheet protector. Use dry erase markers and reuse. This is a fun and easy way to get your kids reading! Sentence Mash Ups Whole Year Bundle: Use these Print and Go pages for a daily word work center, homework, RTI/MTSS time, or extra sight word practice. August/September theme has back to school, apple, and Johnny Appleseed themed pages. Features easy to decode CVC words with sight words mixed in. Each page has one statement, question, and exclamation that students can practice reading for added automaticity and fluency. Students love cutting and gluing these to the paper and provides extra hand eye coordination for those certain students in your class. My ELL and ESE students love these!